The ST is an amazing computer when considering its price and, recently, its software library. The most popular MS-DOS database, dBase III Plus, runs on the ST under dBMan. 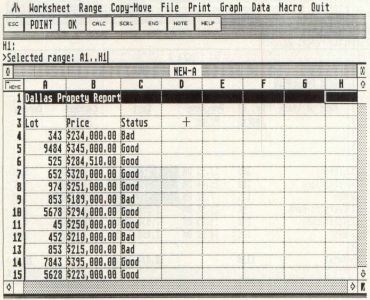 And recently, the most popular MS-DOS spreadsheet, Lotus 1–2–3 (Version 2), runs on the ST under the new LDW Power spreadsheet. While Logical Design Works (LDW) might want to shy away from calling its product a Lotus 1–2–3 clone (think of how Lotus' lawyers might react), LDW Power is an exact replica of that MS-DOS spreadsheet. The two programs are so similar that you can take data and macro programs from the PC to the ST, and vice versa. And the ST version runs more than twice as fast. This could provide quite an improvement in the ST's standing among the business executives who have snubbed the ST in the past. Imagine a purchasing agent trying to decide between the purchase of a $2,500 basic MS-DOS computer clone, versus the price of a $1,300 ST computer. The savings in the software library are just as dramatic: the latest version of Lotus 1–2–3 is sold in Computer-land stores for $340 with LDW Power, holding a list price of only $79.95. The street price of LDW Power is even lower. Previously, ST owners looking for a Lotus 1–2–3 platform had to purchase VIP Professional at $249.95. In its time, VIP Professional was a good workhorse. ST users could use VIP's many Lotus-compatible commands without having to learn a completely new system. But, while VIP Professional was a powerful program, it did not support features built into the more recent versions of Lotus 1–2–3. LDW Power does. How do you measure a spreadsheet? Spreadsheets are most easily compared in terms of size. LDW Power has a small spreadsheet, 8,192 rows by 256 columns, compared to its MS-DOS look-alike. Don't worry; although some Lotus aficionados might think this is a small spreadsheet, it should suffice for just about every ST application. A possible reason for the size of the spreadsheet is the huge size of the program. Lotus 1–2–3 has evolved into a powerful piece of software. By modeling LDW Power after Lotus, the programmers have had to create a program that supports graphics, database functions, a macro-command language and support the mouse/window/menu system of GEM. LDW Power makes full use of the ST's capabilities. The fast processing speed of the ST gives this program a great advantage over Lotus running on an IBM PC or AT computer. The easiest way to see the speed improvements is to scroll around a fairly complex worksheet. 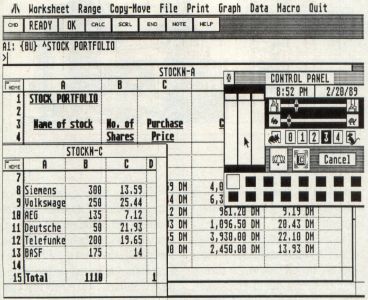 Using a worksheet 20 columns wide and 20 rows tall, LDW Power blazes through the columns left-to-right and rolls the worksheet extremely fast, compared to the same simple functions on the MS-DOS machine. When the worksheet is expanded to 100 columns by 100 rows, the scroll speed does not appreciably slow down. Recalculation speed, also, seems to stay fairly constant throughout several tests. Using the Savage Benchmark test (BYTE, June 1987), LDW Power processed 1,000 iterations of a complex mathematical formula in 39 seconds. The same test using Lotus 1–2–3 on an IBM PC finished in 210 seconds. LDW Power delivers the power, speed and compatibility of its MS-DOS twin. But just how good is it to use on the ST? How good a program "feels" on its host computer can make or break a product. An understanding of LDW Power's other functions is important before making a software purchase. Comparing LDW Power to the other ST spreadsheets does not yield a good understanding of the current state of the spreadsheet market. LDW Power is superior in so many ways to its competition: speed, functions, ease-of-use, macros, compatibility and printer support. So the issues of GEM usage, unusual functions and uniqueness are important in a fair comparison. For example, while LDW Power does everything under the sun at extremely fast speeds, it does not work on a 520 ST without a memory upgrade. Once the 345K program is loaded, several memory buffers are established, and the worksheet window appears. There is only enough memory on a 520 system for 85 cells. In addition, LDW Power is disk hungry. During several trial runs, worksheet files containing less than 100 cells occupied more than 5K of disk storage. The Savage Benchmark, which used 1,000 cells, required 120K of storage. LDW Power really needs a hard disk drive to be useful to the power user. The programming design behind LDW Power is refreshing. The program is of the everything-fits-in-memory variety. Oce loaded, the program diskette may be removed and a data disk inserted. The minimum hardware setup for LDW Power should be a 1040 St system with one double-sided disk drive. ST users who frequently switch between programs—word processor to spreadsheet, etc.—should have a hard disk to use LDW Power since the program is so large, making it impractical to use one of the program switchers, like Juggler. Once running, the program offers few disk-manipulation commands. A file-delete function is available, but LDW Power lacks a file copy, initialize disk and file move functions. Power is compatible with the Universal Item Selector, a commercially available file-selector alternative that provides all these missing functions. A program of this size should feel comfortable to use. Since each ST owner has a different style of usage, the program should conform to the user. But, most of the time, this happens in reverse. Fortunately, LDW Power has several subtle features that make it very easy to use. Upon exiting LDW Power, a special file is stored to keep the user settings established during the work session. For example, once the default file directory of a hard disk has been established, LDW Power saves a special file, LDW.CNF, to be read the next time the program is used. This is one of those nice extras that makes a piece of software more comfortable to use, but one that is often overlooked. For LDW Power users that work with one spreadsheet most of the time, any worksheet titled AUTO.LDW will be automatically loaded when LDW Power is first started. The mouse can be used to select a range of cells for an operation, incorporating the classic "click and drag" to determine the range. If the range extends outside of the current window size of the worksheet, the window automatically scrolls in the needed direction to show the extended drag region. This function works in reverse, as well. The layout of the screen is comfortable: the usual bag of GEM tricks, with a few new controls to add a little spice. The menu bar is designed to emulate Lotus 1–2–3 Circular menus. The Quit entry is a drop-down menu title on the right of the screen. Since most ST users expect Quit to be the last entry in the File drop-down menu, it might take a little getting used to, but the menu layout is skillfully designed. Lotus 1–2–3 does not have the GEM system to draw from, so each command is keyboard driven, although, just recently, versions of Lotus have appeared that lightly support a mouse and windowing system. The keyboard menu commands all begin with the "/" character. Pressing the "/" key in LDW power activates the menu bar. Each menu entry uses a separate keyboard equivalent, usually the first letter of the function. For example, pressing "/Q" quits LDW Power. Pressing "/P" print the worksheet. LDW Power is uniquely good at supporting the keyboard and mouse. After pressing the "/" key, the mouse can also be used to click on the desired menu function. In fact, the mouse and keyboard can be used interchangeably at any time. The left mouse button selects a function, while the right mouse button is the equivalent of pressing the Return key. First-time users will spend an hour getting used to the new system. Directly beneath the menu bar is a row of eight command buttons. Lotus users comfortable with using the keyboard will find the command buttons an easy method of accessing all of LDW Power's commands. ST users who rely on the mouse will most likely not use the command buttons, as their drop-down menu equivalents are always available in the usual GEM menu bar. One of the command buttons, SCRL, puts LDW Power into scroll mode. When active, the worksheet can be scrolled up/down and left/right using the arrow keys. This function isn't needed by mouse users, as the worksheet window has the usual GEM horizontal and vertical slider bars. LDW Power works with desk accessories, so it is also possible to use a calculator or other supporting program. The LDW Power windows can be dragged and sized; however, the desktop area of GEM has been reduced to prevent LDW Power windows from being dragged over the command buttons. This feature reduces the amount of screen display area to 14 rows of worksheet data. It would have been better to allow the command button area to be covered, if so desired. 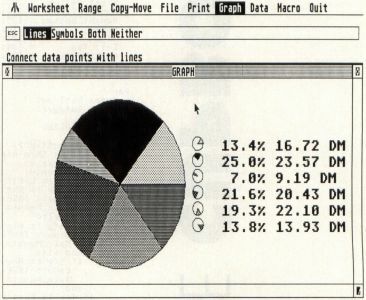 To help make up for this, Monochrome ST computers can use a condensed type style that displays 29 rows of worksheet data; however, many users will find the condensed screen font straining on the eyes. Last year proved to be the year of the accessory. When testing LDW Power, Turbo ST greatly increased the overall display speed. Turbo ST is a software blitter emulator that improves the screen drawing speed of GEM. In addition, G+Plus improved LDW Power's speed when printing drawings to a GDOS-compatible printer. G+Plus is a replacement for Atari's GDOS operating system software. Both products are good investments when using LDW Power, however, they both rob the LDW Power worksheet of valuable memory space. The look of a worksheet can be enhanced by using some of GEM's text effects. Bold and underline can be used to highlight important areas of a spreadsheet. The one noteworthy feature missing from LDW Power is the ability to correct mistakes made using the program's functions. The ST keyboard has an Undo key, but few ST program support its use. In theory, every GEM program should be able to reverse the effects of the last command. For some unknown reason, LDW Power skipped this important feature. At first glance, a spreadsheet appears to be a monomaniacal program. Its sole purpose is to crunch numbers using a metaphor established by accountants: the worksheet. Macros and functions make a spreadsheet much more than a simple computerized version of an accountant's pencil-pushing task. Functions allow data to be tested, and the results of the test can alter the contents of the worksheet or additional spreadsheet functions. Macros make it possible for the spreadsheet to learn about and analyze the information that is entered into the worksheet. 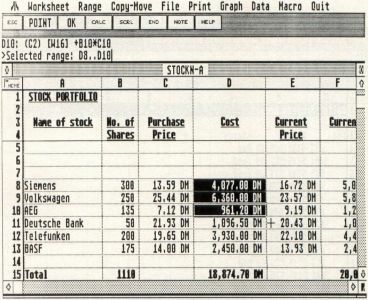 Suppose the spreadsheet is used to enter real-estate information into an ST computer. Since computer unsophisticates are usually used for data entry, the resulting precision of the work can leave much to be desired. Using a spreadsheet macro, the data entered can be tested against predetermined values. If the data entered is bad, the data-entry person can be alerted and asked to enter the information again. Suppose Column A of a spreadsheet is used to enter a series of dollar amounts for houses located in a suburban area of Dallas. The real-estate agency using the spreadsheet has determined that houses costing less than 20% of the average of the other homes entered is a bad risk. After entering the house values, the agency manager wants to see a list of the good and bad homes. To makes this work, Column A is established to receive the name of the house, Column B holds the price, and Column C displays a GOOD or BAD indicator. The IF function tests the first expression, AVG, and yields either a GOOD text value if the average is greater than the house or a BAD text value if the average is less than or equal. LDW Power has a large library of functions, making it easy to create complex, intelligent worksheets. The IF function used in this example works on one cell at a time. Macros automate functions by creating a template of commands. The macro function works like a tape recorder. When recording a macro, the mouse or keyboard is used to move through the worksheet and call functions. When a macro is played back, the user sees the worksheet cursor move through the functions that were previously recorded. A macro used in the home-pricing example moves the cursor from one row to another, allowing the user to enter a home value. The last macro command might produce the printed report requested by the office manager. Printing a report with LDW Power is not a simple function. Since there are so many options, a good read through the manual is needed before the novice user will feel comfortable. Like Lotus 1-2-3, the report-writing capabilities are strong in comparison to other ST spreadsheets. Options include customized headers and footers, page numbering with date and time tags, adjustable margins and borders, user-definable page length and alignment, etc. All selected print format commands are saved with the worksheet. The program supports GDOS, assuring what-you-see-is-what-you-get output when using a GDOS-compatible printer. The list of GDOS printer drivers is short, so be sure to check with LDW for printer compatibility before buying. LDW Power uses a straightforward ASCII printer driver to print the contents of a worksheet. The user can choose output to be sent to the parallel or serial connectors of the ST. Line feeds can be included with carriage return characters, making it compatible with IBM printers. Output can also be sent to a disk file, for later modification using a word processor. A special utility is included that allows LDW Power to print worksheets and other ASCII files at a 90 degree angle. The equivalent program in the MS-DOS world is called Sideways. The LDW utility allows spreadsheets wider than the standard 8½ × 11-inch piece of paper. This is a must for business users. One of LDW Power's biggest features is the ability to directly load Lotus worksheets and macros. MS-DOS users that are equipped with 3½-inch floppy disk drives are in luck. Since the ST floppy diskettes are directly compatible with IBM's disk format, to load a Lotus .WK1 file into LDW Power is as simple as inserting the diskette into your ST drive, and selecting Retrieve from the File drop-down menu. LDW Power takes care of the translation and promptly displays the Lotus file. The key to getting the Lotus information into LDW Power is in the disk drives. The information has to at some point be put onto a 3½ -inch floppy drive. Most new IBM computers are being shipped with 3½ -inch and 5¼ -inch floppy drives, but if your equipment doesn't have this capability, try contacting a local IBM dealer. They usually will copy Lotus files onto a 3½ -inch disk at no charge. LDW Power supports mass import of text and numbers from non-LDW Power files, the data being loaded into the worksheet as text labels. The database functions can later be used to separate the imported data into rows and columns. A similar system can be used with raw numeric data. Hopefully, LDW will eventually release a utility program that imports and exports data from several other formats: delimited, SILK, DIF, etc. Of course, worksheet information may be stored to a disk file. In addition, LDW Power has several sophisticated commands that allow portions of a worksheet to be merged with other worksheets. Complex worksheets can use data contained in external worksheets, a handy function when the maximum number of cells is reached. Worksheets can be secured with the use of a password, up to 15 characters long. A-Calc Prime is the only other ST spreadsheet to support password protection, a feature necessary when selling spreadsheet software to government institutions or the Fortune 500. The word is "good." Overall, LDW has supported the ST community with technical support, dealer support, software upgrades and decent documentation, and the company seems to draw enough revenue from Europe to make a good run of its U.S. operations. LDW has been visible at the latest trade shows and appears have a good future ahead. The LDW Power manual is adequate to show you the ropes; however, overall, the documentation is only fair. The text is informative as a reference, but more pictures and illustrations are needed. Luckily, since Lotus 1–2–3 has such an established name, most book stores carry a complete section of tutorials, primers and other reference books that, due to its similarity to Lotus, also apply to LDW Power. LDW's technical support is first rate. You can reach them at their San Jose, California offices week-days during business hours. If you're looking for a spreadsheet program that'll give you not only the power of Lotus 1–2–3, but also compatibility with that popular program, then you need look no further than LDW Power. Frank Cohen regularly contributes to ST-LOG and ANALOG. His experience with Atari computers stretches back to his first commercial product Clowns & Balloons. 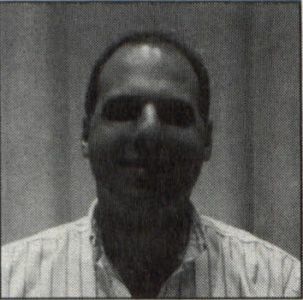 He may be contacted on CompuServe (76004,1573) and GEnie (FCOHEN), or directly at P.O. Box 14628, Long Beach, CA 90803–1208.